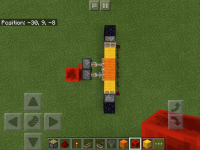 Sticky pistons do not retract blocks when the block is interfered by other pistons that are not supposed to move the block. It is hard to explain by words, so please follow my demonstration for the recreation of the bug. Please refer to the photos attached. Please sort by date and in ascending order (You can do that by pressing the ... button on the right side of the title 'Attatchments' ). The first two photos are switched accidentally, sorry for the mistake. Step 1: Create a setup as shown (Second photo). 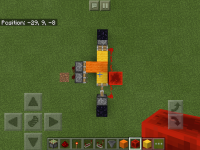 Step 2: Power the left redstone dust line as shown (First photo). 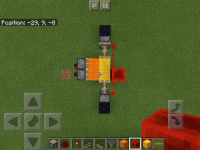 Step 3: Power the right redstone dust line as shown (Third photo). Scenario 1: Both yellow wools extend to the position of the orange wools previously (Fourth photo). This is normal. Scenario 2: The top yellow wool extend to the position of the top orange wool previously, but the top orange wool get pushed by the top sticky piston and the yellow wool to the position of the bottom orange wool previously. 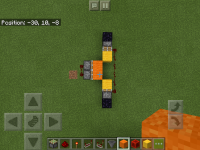 The bottom yellow wool cannot be pushed as it is blocked by the piston and the blocks while the bottom orange wool previously get retracted by the bottom sticky piston (Fifth photo). 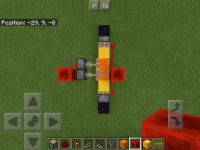 This is considered to be a bug as the top sticky piston did not retract the top orange wool. Scenario 3: The bottom yellow wool extend to the position of the bottom orange wool previously, but the bottom orange wool get pushed by the bottom sticky piston and the yellow wool to the position of the top orange wool previously. 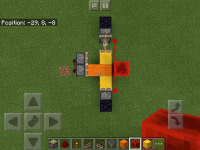 The top yellow wool cannot be pushed as it is blocked by the piston and the blocks while the top orange wool previously get retracted by the top sticky piston (Sixth photo). This is considered to be a bug as the bottom sticky piston did not retract the bottom orange wool. This bug takes time to recreate. Thank you for the patience of the staffs.